Pressure guage reading accuracy is typically better in the middle portion of a gauge. The first and last quarters of a Grade B pressure guage tend to have an accuracy of 3% while the middle half has an accuracy of 2%. With the staggering variety of pressure guages available (we have capabilities for more than 400 types), our calibration technicians have fielded questions ranging from reading discrepancies to which pressure guage is right for a job. 1. How can two similar 1000 psi pressure gauges calibrated at the same time have different readings and both be right? Many of the pressure gauges calibrated in our lab are Grade B with an accuracy of ±3%, 2% and 3% of span. This means that the first and last quarters of the gauge have an accuracy of 3% while the middle half has an accuracy of 2%. On a pressure gauge with a range of 1000 psi, the upper and lower quarter readings can be ±30 psi of the reading, while the middle half is ± 20 psi of the reading. In this example, if you are measuring a pressure of 500 psi, the tolerance is from 480 to 520 psi. One gauge could be indicating a pressure of 495 psi, which is well within the tolerance, while a second gauge indicates a pressure of 505 psi and also be within tolerance. Both are within tolerance although there is a 10 psi difference between the two gauges. 2. Why isn’t the gauge aligned to its nominal setting? Because an alignment affects the entire span of the gauge, any adjustments to the readings in the center will affect the zero and full scale settings. An alignment attempts to minimize any discrepancies between the zero, midrange and full scale settings. There is an inherent drift in different types measuring equipment. If a pressure gauge is reading slightly low during a calibration, a subsequent calibration may show the gauge reading slightly high. If the unit is aligned for nominal at each calibration, the drift would cause the readings to possibly be even further off the nominal readings. Another factor in calibrating pressure gauges is repeatability. Due to needle drag and overshoot during the calibration process, identical input pressures will read differently on the pressure gauge being tested. Every attempt is made to minimize these discrepancies during the calibration process, but they are still an inherent characteristic of pressure gauges. 3. What grade pressure gauge should I be using? The accuracy of the reading is typically better in the middle portion of a gauge. For this reason, you should always select a gauge with a range that is about double your maximum anticipated pressure. Continuing with our example above, if you need to measure a pressure of 500 psi ± 10%, a Grade B, 1000 psi gauge will do the job. 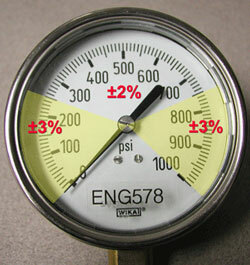 If you need to measure a pressure of 500 psi ± 1%, a Grade B, 500 psi gauge will not be accurate enough. Another reason to have your pressure readings towards the middle of the range is to avoid damage if there is a sudden pressure spike. If you are measuring a pressure of 500 psi with a 500 psi gauge and the pressure spikes to 600 psi, your gauge just became over pressurized and is probably damaged. If you used a 1000 psi gauge in this same scenario, the pressure spike is still within the range and will not damage your gauge. Duncan Aviation Calibration Services calibrates over 1,500 pressure guages every year. For more information, contact us at 402.479.1698.